Not being the sort of person to dwell on such things, I'd no idea until today what my perfect day would look like. Now I know and just on the off chance anyone wants to know without the requirement to make small talk, here it is. Sorry fellow devoted parents, but it started with dropping one child off at nursery and handing the other off to Grandma (thanks Mum). Then Ang and I got on our bikes and headed out. It wasn't perfect weather for riding as the roads were a little damp and largely strewn with wet leaves. But any day that starts with a rideout, no matter what the weather, is bound to be a nice day. Ang has built a lot of confidence since she spent the summer riding to work. I led the way up to Patley Bridge, across to Lofthouses then north towards Masham. They're narrow roads with tight curve after tight curve, steep hills, tired tarmac strewn with gravel and the odd sheep. Add to that the autumn leaf fall and the roads get tricky. Ang took it all and handled her little YBR125 beautifully. When we did stop for coffee high up on a stunning moor, Ang was still smiling and so was I. After coffee, we carried on to Masham. It's a wonderful place where instead of pay and display machines and patroling 'Traffic Enforcement Officers,' there's an honesty box and a suggested parking fee of 50p. Usually, I wouldn't bother paying to park my bike unless I know they ticket bikes which haven't. But in Masham, parking is a matter of Honesty. I couldn't Steal parking. As I dropped the full whack, a whopping 50p per vehicle a passing local, who must have thought Ang looked hungry, pointed her in the direction of the Suncatchers Cafe. That place is awesome and is a metaphor for multicultural Britain as I like to think of it. I was served a full cooked breakfast in a Yorkshire Market town, by a woman who was not apparently of European decent and had a broad Scottish accent while surrounded by what seems best described as loads of Arabian type stuff. 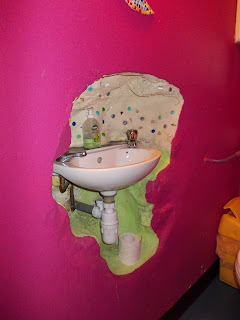 Even the toilet was kind of cool because they made room for a wash basin by digging into the thick stone wall. Ace! After that we pretty much rode home and spent time together pottering about Harrogate, drinking more coffee. The new Baltzersens Cafe is also rather good, particularly because it's spacious, has some very comfy seats and the actual coffee is superb. It's a perfect place to while away the afternoon and catch up with the world, sitting by your wife as she catches up with whatever they feel important enough to publish in 'Prima' magazine. Thus my perfect day began to draw to a close. I'd had a ride out though my beautiful Yorkshire Dales. I'd found new and wonderful places. I'd had a full cooked breakfast and superb coffee. And all of this was quality time spent with Ang (as opposed to time spent placating children with my wife). However, this would not have been enough on it's own. At the end of my perfect day I was alone in my garage, just me, my bike and my power tools. I'd bought a metal work vice because I needed to modify some M8 bolts and the woodwork vice I've already got is no use for grinding. Unfortunately, I rather cleverly used the last of the M8 nuts attaching the vice to a wooden block making it impossible for me to complete the job on the garage door. That's fine though because next time I have a perfect day, I will have a good reason to finish it off in the garage, with my bike, playing with power tools.